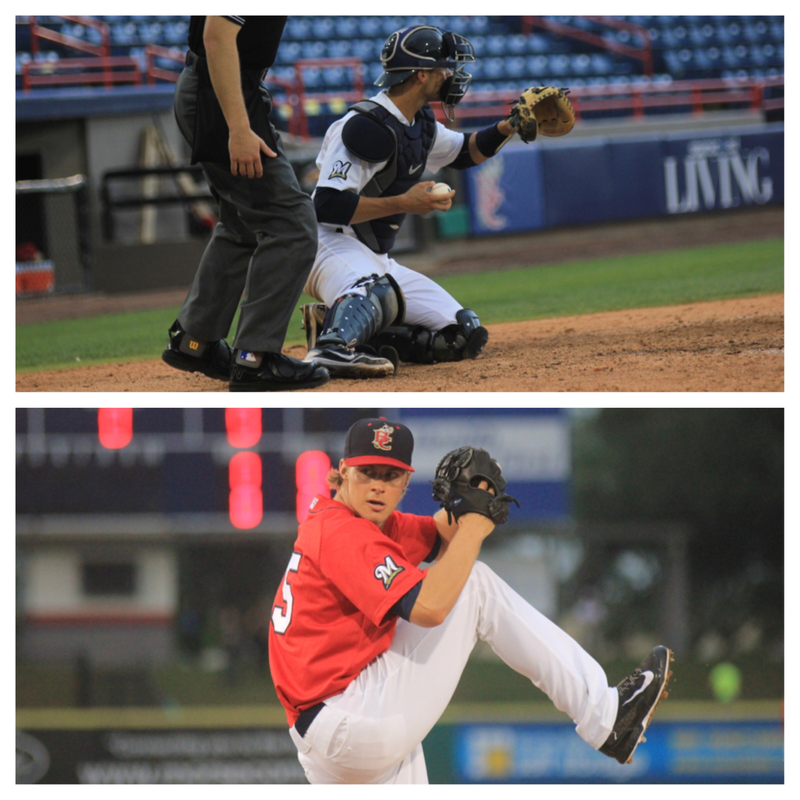 C Cameron Garfield hit at a .467 (7-for-15) clip against Daytona, while LHP Jed Bradley earned FSL Pitcher of the Week for his efforts. With back-to-back 5-2 victories over the Daytona Cubs on Friday and Saturday evenings the Brevard County Manatees completed a four-game sweep against their I-95 rivals. By taking all four games from Daytona, Brevard County has tied its season-high with four straight victories, but more notable was the way the Manatees did it. The ‘Tees bats battered Cubs pitching by hitting at a .319 clip (43-for-135) with four home runs, including three on Saturday night. However, Joe Ayrault’s club didn’t just get it done with the long ball. In the four-game set the Manatees recorded an incredible 16 extra-base hits. Nathan Orf, who hit leadoff throughout the series, was a particular menace against the Cubs. Orf, who was hit by a pitch in each of the first three games, tallied four runs scored, three doubles, a triple and drove in a run against Daytona. If Orf was a nuisance, catcher Cameron Garfield was a demoralizer. The California native put together the best series of his season by absolutely mashing Cubs pitching. Garfield extended his hitting streak to 10 games by batting .467 during the four-game series (7-for-15), including multi-hit performances in each of the first three nights. Garfield made his mark by tallying five of Brevard’s 16 extra-base hits. The catcher doubled four times and drove in three runs during the series’ first three matchups, before punctuating his dominance in the finale. After an error by Gioskar Amaya kept the third inning alive, Garfield demolished the first pitch he saw from Cubs starter Jose Rosario well over the manual scoreboard in left field for a two-run homer, his first of 2014. The blast gave the Manatees a 3-0 lead and ended up being the deciding blow in a 5-2 victory. The Manatees pitching was equally, if not more, impressive. The pitching staff allowed four runs, only two earned, over the course of the series good for a microscopic 0.50 ERA. The ‘Tees staff also produced a multitude of swings and misses, striking out 38 Cubs, equaling an average of 9.5 per game. Left-handers Jed Bradley and Hobbs Johnson were both dominating on Thursday and Saturday nights, respectively. Bradley pieced together arguably his best performance of the season, allowing just two hits and two walks, while striking out seven hitters over a season-high 6.2 shutout innings en route to his second Florida State League Pitcher of the Week award. Johnson was no slouch either. The North Carolina product struck out a career-high nine batters on Saturday night in Daytona. The lefty shutout the Cubs through his first six frames, then surrendered two runs (one earned) in the seventh before being removed with one out. The 6.1 innings of work was the longest outing of Johnson’s career. The sweep gives Brevard County a 7-5 series edge over Daytona with eight games remaining in the I-95 rivalry for 2014. The Manatees have not won the I-95 Trophy since they took 11-of-18 games against the Cubs back in 2007. Future Major League outfielder Lorenzo Cain (.309 AVG) and shortstop Alcides Escobar (.395 AVG) batted over .300 during the season series, while catcher Angel Salome hit a gaudy .441 (15-for-34) in 9 games that year against the Cubs. Future Brewers infielder Mat Gamel led the offensive charge in ’07, recording 11 extra-base hits in the season series (eight doubles, two triples and one home run) while driving in 11 runs. Another eventual Major Leaguer, pitcher Mike McClendon, dominated the Cubbies on the rubber. The right-hander went 2-0 with a 1.42 ERA in three starts against Daytona. This four-game shellacking is the Manatees first four-game sweep against the Cubs since they took the final four matchups in 2011. Future Brewers pitcher Hiram Burgos allowed one run over 5.2 innings to pick up the win in the first game, while current ‘Tee Austin Ross started and recorded the victory in a 15-4 victory against Daytona in the second meeting.